Starting out as charming peachy pink cups, gradually opening to form neatly cupped rosettes. 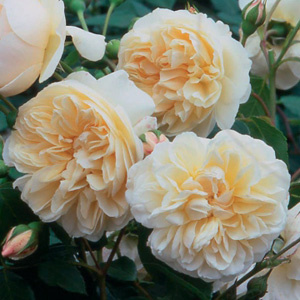 Each bloom has a perfect ring of creamy-apricot waxy petals enclosing numerous smaller petals. Eventually the petals turn back to form a large, domed, creamy-white flower. The overall effect in the mass in sunshine is almost pure white. Lichfield Angel will form a vigorous, rounded shrub which, with its blooms nodding attractively on the branch, will make a fine sight. It is very useful in a border, as it harmonises well with all other colours and will act as an intermediary between pinks and yellows. The fragrance is generally light but has strong elements of clove at one stage.